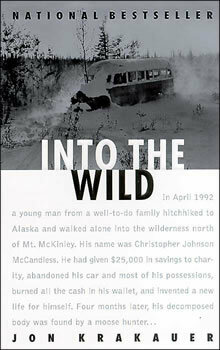 The Text and Community selection for 2006 is Into the Wild by Jon Krakauer. This nonfiction work is an engrossing account of Christopher McCandless, a recent college graduate who gives away all his possessions, changes his name to Alexander Supertramp, and hitchhikes to Alaska in order to experience wilderness in a raw, unmediated form. Four months later, in a remote campsite in Alaska, a hunter discovered McCandless's dead body. Krakauer is part detective, piecing together the young man's journey north, and part psychologist, explaining the allure of the wild and the powerful sway it holds over the American imagination. Text and Community is a program of the GMU English Department. This web site is sponsored and maintained by the New Media Group in English with the assistance of the College of Arts and Sciences.